You know that I write mostly on subjects like the mind-body connection, self-love, my dog Oscar who passed away last year, as well as kindness and compassion and the science of how they affect our health. But also, from time-to-time, I write on more ‘out there’ topics, like synchronicities, the nature of consciousness, and interconnectedness, as I have covered all of these subjects in some of my 8 books. OK, so this is one of those. It’s an experiment in interconnectedness – how we are connected through space. Quantum Physics has shown us entanglement, where the state of one particle is correlated with the state of another, irrespective of distance (and now time, it seems). Numerous studies have also show correlations between the physiological or neurological states of two people even if they are separated in space. In June, I unexpectedly participated in such an experiment. I was running my annual 5-day ‘Integrating Science’ event, where I show people how to integrate science into their own practices. I host the event at my favourite holistic centre, Lendrick Lodge, in the Scottish countryside. 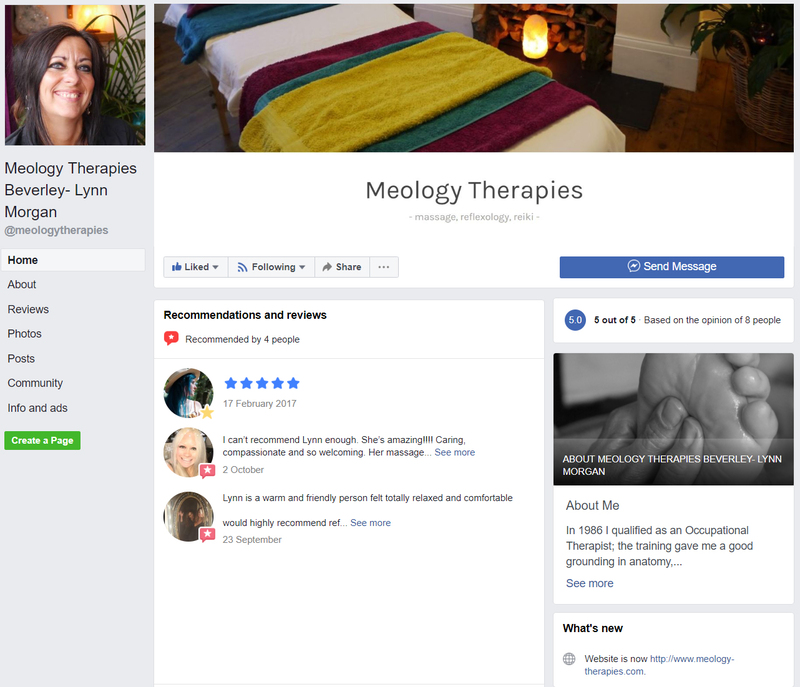 As well as mainstream topics like the placebo effect, meditation, visualisation, emotional contagion, the effects of compassion and kindness on the brain, heart, and inflammatory process, I also cover more ‘out there’ subjects. On the third evening of the course we (the participants and I) were having a discussion about the interconnectedness of life and discussing some of the scientific evidence of it. We discussed experiments that seemed to show the connections using MRI or EEG. These experiments note correlations between the neural states of people who are separated by a distance; that is, as one person’s state changes, it seems to correlate with a change in state of the other person at precisely the same time. We discussed how these correlations tend to be strongest when two subjects (people) in an experiment share an emotional bond. One of the participants (Ann) suggested that we try our own experiment, given that by this stage of the course, the group had emotionally bonded really well. I happened to have my heart monitor with me, a device called ‘emWave’, by Heartmath, so Ann suggested we connect one of the participants to the device and then the rest of the group would ‘send’ loving and kind intentions from another room. Another of the participants (Rebecca) volunteered to be connected to the device. I sat with her in the teaching room while the group gathered in the dining room where they would then ‘send’ their intentions to Rebecca. When we first decided on the experiment, we had simply discussed seeing if the group could collectively focus on Rebecca and we’d see if this correlated with a change in Rebecca’s heart rhythms (as measured by the heart monitor), so I assumed they were going to focus on Rebecca within a minute or so. Unknown to me, Ann suggested to the group that they modify things. So they decided to do an ‘on-off-on’ kind of experiment, where they would ‘send’ loving-kindness to Rebecca – then stop – and then start again. Ann spent some time (9 minutes) going through the set-up with the group, explaining they that would do a loving-kindness meditation directed towards Rebecca, or whichever each individual felt most comfortable with, and they’d do it for 2 minutes. The loving-kindness meditation is a Tibetan Buddhist meditation also known as ‘metta’ that has been shown to have a whole range of positive health benefits. Following this they would do a 1-minute disconnect, where they would withdraw their focus from Rebecca and focus on something stressful in their own lives for a period of 1 minute. Following a short 15-second calm period to refocus, they would again focus on sending loving-kindness to Rebecca for another 2 minutes. So, all in, they would do 2 minutes on – 1 minute off – followed by 2 minutes on, hence ‘on-off-on’. Throughout the whole time, Rebecca simply closed her eyes and relaxed. I sat beside her and did the same. At the end of the time the group came back into the teaching room. We were all stunned by the results. As you can see from the charts below, the rhythms of Rebecca’s heart correlated extremely accurately with the state of the group. At the point when they first ‘sent’ loving kindness, there was an immediate and dramatic increase in the coherence of Rebecca’s heart rhythms. OK, first a wee bit about what the heart monitor shows. It measures Heart Rate Variability (HRV), which is the difference in your heart rate as you breathe in and out. Mostly, your heart rate should increase a little as you breathe in, as the sympathetic branch of your autonomic nervous system (ANS) kicks into gear, and then it should decrease a little as the parasympathetic (vagus) branch of your ANS kicks in, initiating the ‘rest and relax’ mode. The difference between the high (on the increase) and the low (on the decrease) is called heart rate variability. When HRV is very ordered and stable (or smooth) it is referred to as coherence. At the precise moment when the group sent loving-kindness to Rebecca (at 9 minutes), there was a huge increase in the coherence of Rebecca’s heart rhythms. If the group were indeed affecting her then their collective intentions were actually affecting Rebecca’s ANS and her heart rhythms! 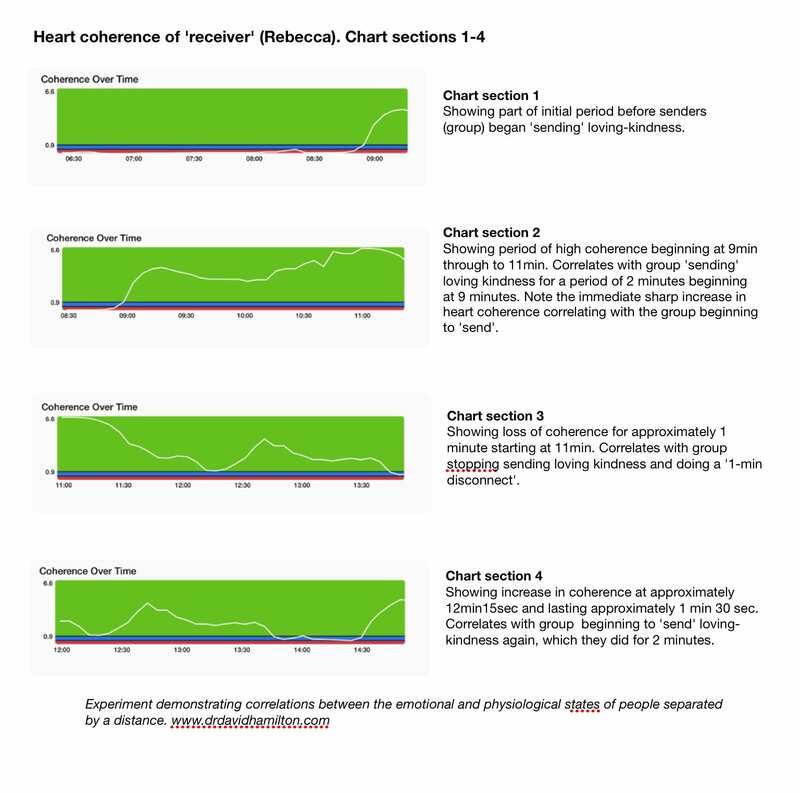 The group sharply withdrew their loving and kind focus on Rebecca after 2 minutes (at 11 minutes on the chart), and as you can see from the chart, this correlated with a sharp decrease in the coherence of Rebecca’s heart rhythms. For the next 1 minute, the group did a ‘disconnect’, where they focused on something (or someone) stressful in their lives. During this time (from 11 minutes to 12min 15 seconds), Rebecca’s heart coherence dropped significantly, as you can see in the chart. What about that extra 15 seconds? At the end of the 1-minute disconnect, the group paused for about 15 seconds to gather their focus before beginning a second 2-minute period of loving-kindness focusing on Rebecca (at 12min 15seconds). Again, this correlated with an increase in Rebecca’s heart coherence. I find the timing up to this point really quite astonishing. The synchronisation between the intentions of the group and the changes in Rebecca’s heart rhythms is to within a few seconds. The final 2-minute period didn’t correlate quite as well, although Rebecca’s heart rhythms remained coherent for one and a half of the two minutes (from 12min 15 seconds through until 13min 45seconds). If we were indeed seeing a connection between Rebecca and the group, which I believe we were, then there could be any number of reasons for this. Only repeats of the experiment, perhaps with more ‘on-off-on’ periods would prove for sure what we were seeing. So assuming we are seeing true interconnectedness, what does this tell us? It tells us that we are far more connected that most of us assume. It suggests that maybe we can have health-giving effects on our loved ones even when we’re not in their presence, simply by holding an idea of them in our hearts and minds and filling this idea with love, kindness, and compassion. On the contrary, how often do we lose ourselves in the frustrations of life? Could we be having subtle negative effects on people we mentally focus our frustrations on? Maybe. Maybe not. I’m not so sure, to be honest. We didn’t measure the negative side of things. The group didn’t send any negative intentions towards Rebecca. That would not have been right. Instead, they simply removed their positive intentions. My gut feeling is that loving intentions are more powerful than ones based in fear. If it were the other way around, I doubt our species would have survived this long. Connections also seem to be stronger when there is an emotional bond present, and I’d suggest that bond needs to be a warm bond, infused with empathy, compassion, love, kindness. From my reading of other experiments, I’d say empathy is key as it’s from empathy that other positive and loving intentions arise. So I personally think people in our lives would benefit more if we tried to think of them in their best light. It can be difficult, especially when we have a lot going on and when we have issues with some people, but then almost everything can be improved with practice. Perhaps, believing that our intentions can help others could serve as motivation to practice. So here’s my advice. It’s pretty simple, really. Here it is: Try to see the best in people. You never know what’s going on in a person’s life (or has happened in their past) that causes them to behave in the way they do. Let this simple idea guide you to at least trying to see the best in people.